Astra Games Reel King slot machine is what defies a classic slot machine. Over the 5 reels and 20 paylines you will find cherries, plums and a jackpot bag of money. A randomly given bonus feature appears as a mini slot and will pay you handsomely. Make sure you try this excellent machine. Graphics & Appearance: The Reel King is a very classic slot machine. You will find symbols like cherries, plums and the jackpot bag of money. Gamble Feature: The gamble feature on The Reel King is a 50/50 chance to double your winnings. If you succeed you will have the options to collect or gamble again. If you lose, you will return to the game. Game Symbols: In this slot you will find all the classic symbols like the cherries, plums and the Jester Hats. The Jester Hat is the Wild and will substitute as any symbol. There are no scatter symbols in this slot. The lower paying symbols are the 10, Jack, Queen and the King. You can see the different payouts for the different symbols if you click on the Paytable button which is located in the lower part of the game window. The payouts that you will see on the paytable are based on your stake. If you change the stake amount, the payouts on the paytable will change in accordance with your stake. Bonus Feature: The bonus feature is triggered randomly and a mini slot appears on the screen. This will award cash prizes and pay out generously. Betting Options: The Reel King slot machine allows you to play on 20 paylines over 5 reels. You can easily configure your stake preference by using the + and – symbols in the lower part of the game window. 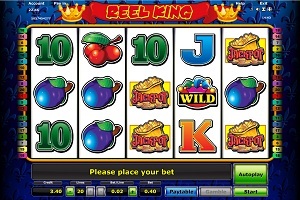 Game Features: The Reel King offer the players to use an Autoplay feature. By using the Autoplay feature you will not have to click on the Start button for every spin you wish to play. This feature can be very comfortable to use in order to be able to sit back and relax in a nice gaming environment. The Autoplay is activated by simply pushing the Autoplay button in the bottom right corner of the game window. You don’t have to set a certain amount of spins that you wish to be played automatically. You just need to activate it. Once this is done, the feature is easily stopped by clicking on the Stop button. Note that you will not access the Gamble Feature while you use the Autoplay.